East Greenwich is an affluent town in Kent County, Rhode Island. 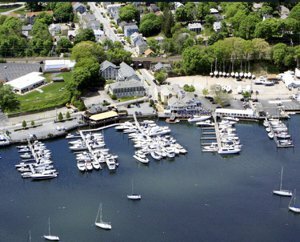 East Greenwich is a quintessential New England town with all the charm and character one would expect when they come to the East Coast of "Old America." The population is only around 13,000 and a median home value of $382,400. Main Street in East Greenwich has expanded over time with great restaurants like Rasa, Dante's Kitchen, and the Greenwich Bay Oyster Bar populating the street along with other small shops, bakeries, stores and services. Just off Main Street in the popular Marina District, classic waterfront party-goer options like Blu on The Water invite you in for a craft cocktail or dinner overlooking the marina. 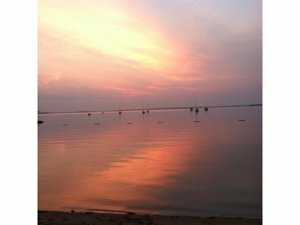 Don't underestimate the beauty of a sunset overlooking all the sailboats in East Greenwich. Over head view of the Marina in East Greenwich. The East Greenwich School System has long been revered by local residents. For more information on the schools please feel free to check out this objective third party report and see one of the many reasons why East Greenwich has long been one of the most stable communities in RI. During the recent economic downturn, East Greenwich experienced smaller losses in property values than almost any other town in Rhode Island. For stats and graphs on this please follow up with a Matt Patty Team member. Surrounding the town, neighborhoods like Hill and Harbour District, Howland Farms, Lillibridge, Tanglewood, Sun Valley and Meadowbrook offer a mixture of middle to upper income homes, along with convenient amenities like gas heat and town sewers. Over the past ten years, a lot of home buyers have been moving closer to town for the convenience, amenities, charm and character. Outside of town, East Greenwich is a classic suburban community, west of Route 4 the neighborhoods like Fox Ridge, Westwood Farms, LongMeadow, High Hawk, Chestnut Hill, Signal Ridge and so many others offer ample lot sizes, spacious well appointed modern construction homes that luxury buyers are looking for. East Greenwich is conveniently located, a quick shot up through the Apponaug section of Warwick for access to Route 95. (See map of East Greenwich) and a quick shot from town into North Kingstown to get to Route 4 for access to South County and the beaches. Matt's team maintains a membership in the East Greenwich Chamber of Commerce and ties to the community where they spend so much of their business and professional time. If you or someone you know is looking to buy or sell in East Greenwich then you've found a Team of professionals that get the vibe of the town. You can contact us and we'll get started with making your Real Estate Dreams into Reality.